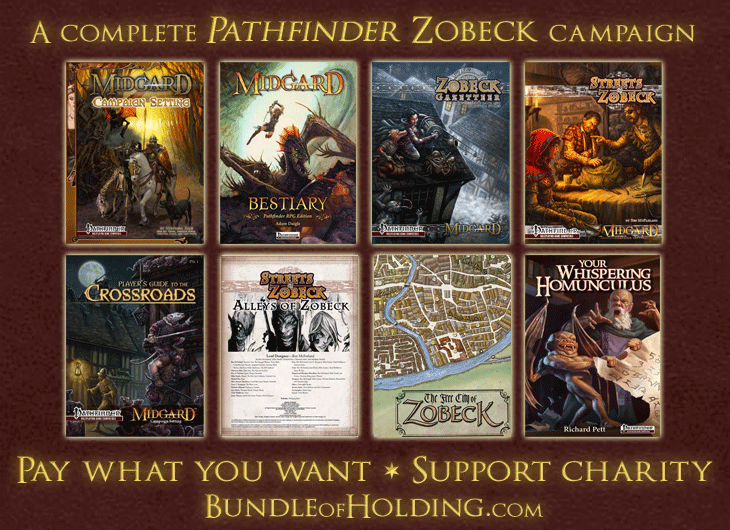 Last Call for Bundle of Zobeck! You still have a chance to grab the wondrous Bundle of Zobeck — now with seveneight great Midgard PDFs! This special set-your-own-price offer ends early on Saturday, so move fast. We’ve just added a new item to the Bundle: Your Whispering Homunculus by Richard Pett! This book is the GM’s humble servant and guide to the vile, whimsical, disgusting, bizarre, horrific, odd, skin-crawling, and mildly disturbed side of fantasy gaming. It provides wonderfully lunatic ideas and encounters to keep your players on their toes – along with tips on how to make ordinary creatures and locations truly memorable. 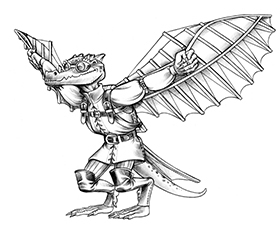 Proceeds from the Bundle of Zobeck sale go to benefit two of Kobold King Wolfgang Baur’s favorite causes: Heifer International and the American Association for the Advancement of Science (AAAS). 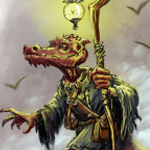 The Bundle of Zobeck offers an outstanding collection of eight Kobold Press ebooks for Pathfinder Roleplaying Game — characters, locations, magic, and adventures. For one price you set yourself, you get more than 500 pages of DRM-free watermarked PDFs — an entire Pathfinder fantasy roleplaying campaign featuring the Midgard setting and, above all, its bustling, ever-ticking Free City of Zobeck. Get the Bundle of Zobeck today! Wow, couldn’t say no to all that!